Jeff has been a part of the Spinning® program since 1995 when he started taking classes at Sports Club LA. He went on to become a Certified Spinning Instructor and a Master Instructor, eagerly taking up the opportunity to travel around the world, teaching fitness. With two teaching credentials and a Master's Degree in Special Education, he is a teacher for severely handicapped children and has begun working on a PhD in Childhood Education. He is also an ACE and AFAA certified Group Fitness Instructor.With a passion for teaching, Jeff enjoys organizing easy-to-follow lesson plans and putting them to music, emphasizing the accessibility of the Spinning program. He especially likes music with a consistent rhythm, songs that have intense, heavy beats, and, most of all, songs that are full of fun! Jeff attends the WSSC Conference every year, and he believes that every year it gets better. He is always thrilled when instructors tell him that he played a role in making their teaching style a little more refined.Always encouraging to aspiring instructors, Jeff’s advice is to learn to do it right first—learn the movements and guidelines before making decisions on how you intend to teach. That way, you can develop your own style. Like Jeff always says, “you’ll get this, it’s easy.” Jeff especially appreciates all of the presenters to have been with the program for an extended period of time—those who decided to join the best indoor cycling program in the world, and stay with it through all of the good times as well as the challenges. 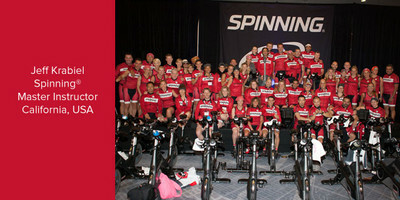 Spinning is exhilarating, it’s great, it’s fun, it’s high heart rate, it’s high energy—you get what you want out of it. You’re in a group ride, but you’re achieving individual goals within that group ride. That’s wonderful and it’s unique as far as group exercise goes. Spinning is for everyone who wants to get another level of fitness. You’ve just got various ages, various fitness levels all participating on their bike. I love to take the music and guide people on a journey.